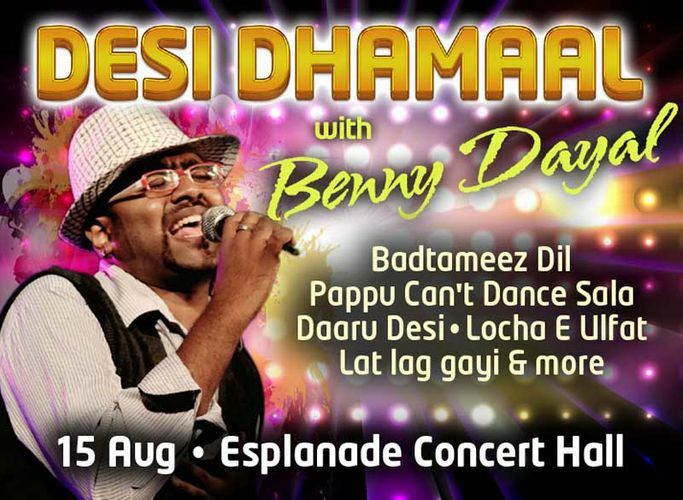 Arte Compass and Zee Tv jointly bring to you Desi Dhammal with Benny Dayal on 15th Aug at Esplanade Concert Hall. In his first solo outing, Benny will groove to Bollywood chartbusters like Badtameez dil, Daaru Desi, Lat lag gayi, Pappu can't dance sala, Locha E Ulfat and more. Currently the voice of young and peppy songs, Benny has sung hit romantic songs like Kaise Mujhe tum mil Gaye, tu hee mera dost hain etc. Benny is a member of the band S5 launched by the channel SS music. He has sung for top music directors including A R Rahman, Salim Sulaiman, Amit Trivedi, and Pritam in various languages like Tamil, Hindi, Telugu and Malayalam. He has sung in movies like Yeh Jawani hain Deewani, Student of the year, Race 2, Cocktail, Ek mein hu aur ek tu, Ghajini, Heroine and many more. Get ready for nonstop entertainment! Not be missed event!